Emails were exchanged and the request soon escalated into more than simple reprint permission. KI6JJS also requested assistance with creating his actual presentation script. Soon, another offer was accepted, that of a complete “W2IK Emergency NVIS Antenna System” (Which was displayed, with a sign promoting the RACES forum, along the driveway entering the event hotel.) Concepts, such as which tuner to use for NVIS and why NVIS offers more than “propagation enhancement” during specific times, were discussed. Later, W2IK also supplied KI6JJS with a “W2IK Emergency Deployable VHF/UHF Antenna System” to give as a gift to one of the attendees of his forum. Note: All of the CDs and antennas were supplied free of charge by W2IK in order to insure a successful event. KI6JJS copied several different W2IK web pages (Emcomm and antenna construction) to give as handouts to all his attendees during the forum. 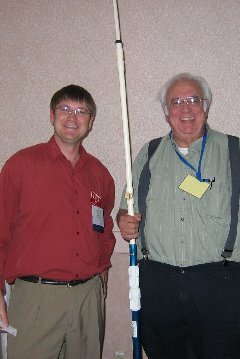 His report on the outcome of the forum was that it went “extremely well” and that the winner of the VHF/UHF antenna was so excited that he assembled the 16 foot telescoping VHF antenna “on the spot” and accidently poked out a ceiling tile! It was also reported that Per had only 5 CDs of the W2IK Ecom training manual left after the forum!